Guitarist James O'Sullivan is a longstanding member of Eddie Prevost's Workshop, one of the main driving forces of improvised music in London. The Workshop has been running every Friday evening since November 1999, with O'Sullivan attending since 2004. Although O'Sullivan has appeared on disc beforenotably on Winterlands (Forwind, 2011), by the innovative songs-plus-improv quartet Clang SayneFeed Back Couple is his first solo album. 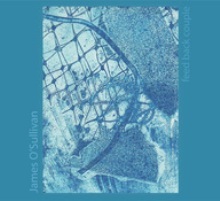 Its six tracks were performed, recorded and produced by O'Sullivan between April and June 2010. O'Sullivan plays amplified electric guitar, preferring to lay it flat on its back on his lap and employ a wide range of extended techniques to generate sounds from it; these include using metal slides on the strings, striking the pick-up with a rubber-headed stick and exciting the body of the guitar with the same implement. Although O'Sullivan undoubtedly plays in a post-Keith Rowe manner, to date no signs of attached springs or handheld fans have been seen. He uses no added "effects," but amplification is key to the music, making the smallest of gestures clearly audible. For a solo player, O'Sullivan manages to produce rich and varied music in a continuous stream without any flat patches or lapses. He is adept at generating several complementary sounds simultaneously, often creating the impression that there is more than one player at work. By using a volume pedal he also adjusts his instrument's volume whilst playing, creating peaks and troughs to add drama and emphasis. O'Sullivan does not chop and change between sounds, but allows himself and the listener sufficient time to explore and appreciate the possibilities of an avenue before moving on. While there is considerable variation and contrast between the six tracks, they cohere into an album that has a pleasing feeling of unity, one that handsomely repays the time invested in listening to it. Track Listing: Stem; Feed Back Couple; Desire Paths; Instant Wait; Hiddens; Fine Line.